Left to Right: Mary Ellen Upton, WP Executive Director; Gary L. Springer, WP President; Dr. Elvis Ahmedi, Kosovo National Board for Cancer Control. In 2014, World Partnerships was deeply honored to be recognized by the Minister of Health of Kosovo for our longstanding partnership with Dr. Elvis Ahmedi, a breast cancer surgeon from Kosovo, who is a 2008 IVLP World Partnerships alumnus. In 2009, we partnered with Moffitt Cancer Center and Dr. Ahmedi on a Webcast training project to help create a Tumor Board peer review system in Kosovo. 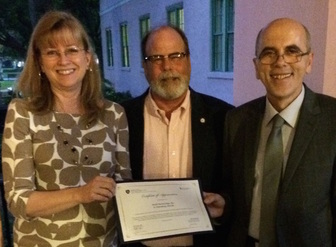 Dr. Ahmedi returned to Tampa Bay as an IVLP "Gold Star Alumnus" in 2011, conducted a tumor board project for two of his patients at Moffitt, and was made an Honorary Member of the Moffitt faculty. 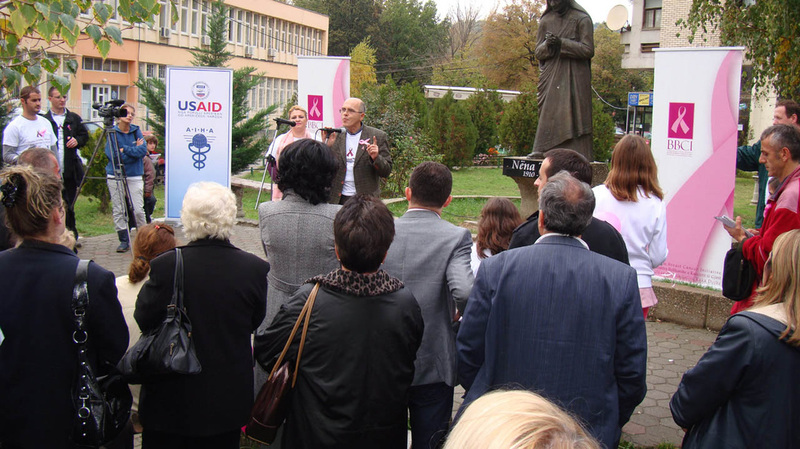 For the next two years, he organized the Cancer Registry for his country, and, in 2013, Dr. Ahmedi was appointed to head the Kosovo National Cancer Control Board, an outgrowth of his work on the cancer registry. 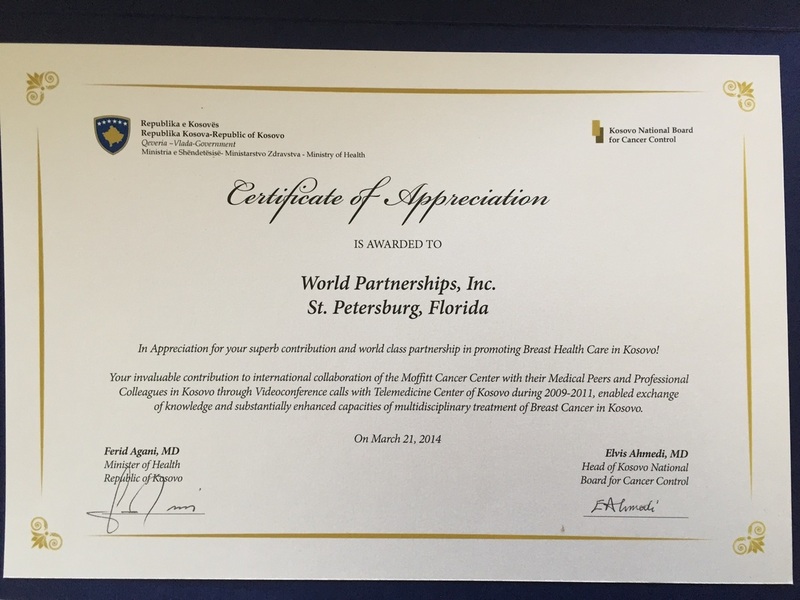 In March, after he received a prestigious international breast cancer award in the U.S., he returned to St. Petersburg to renew his work with Moffitt and World Partnerships, and recognize their contributions to cancer care in Kosovo. As Dr. Ahmedi has said many times, this project "saves lives" in his country. 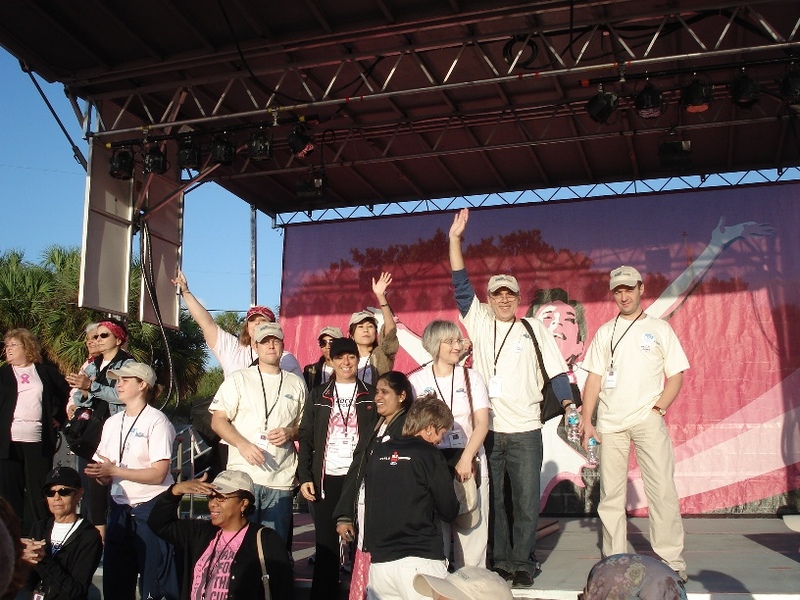 In October 2008, World Partnerships created a program for 28 IVLP visitors – physicians, health care professionals, non-profit leaders – who came to Tampa Bay on a worldwide US Department of State initiative to build capacity for breast cancer awareness and treatment. This IVLP program was initiated by then-First Lady Laura Bush. 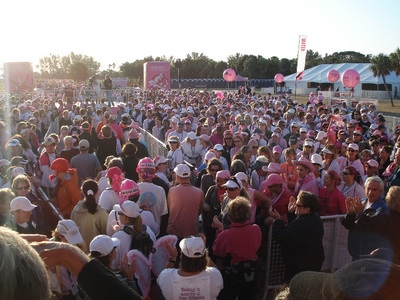 In addition to participating in the Susan G. Komen Foundation's "Three-Day for the Cure" awareness-raising walkathon, World Partnerships organized professional meetings for the group with Moffitt Cancer Center (Tampa), the Susan G. McGillicuddy Breast Center at St. Anthony's Hospital (St. Petersburg), and a breast cancer awareness training seminar led by the Komen Foundation. St. Anthony’s Hospital sponsored the seminar breakfast at the Renaissance Vinoy Resort. Moffitt Cancer Center also hosted the group for an afternoon tour of their complex and an overview of their cancer research and treatment programs. 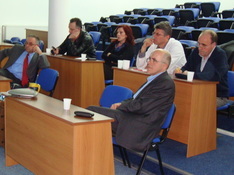 Surgeons at the Telemedicine Centre of Kosova participating in a conference call and Webcast with Moffitt Cancer Center, March 25, 2010. Photo courtesy of Dr. Elvis Ahmedi. 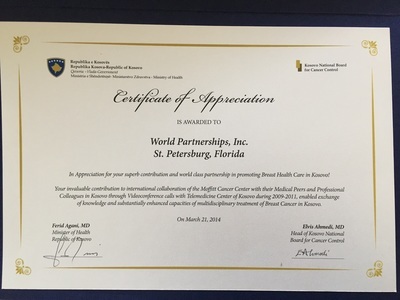 Dr. Elvis Ahmedi, a thoracic surgeon from Kosovo and leader of the Balkans Breast Cancer Initiative (BBCI - originally created through the efforts of the US Embassy Prishtina), asked World Partnerships to help build a collaborative professional relationship in the Tampa Bay Region for him and his fellow physicians. World Partnerships partnered with the Moffitt Cancer Center (Tampa), which offered to work directly with cancer surgeons and related healthcare specialists in Kosovo. 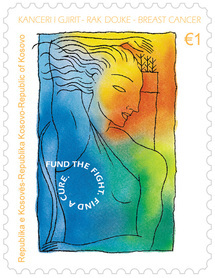 This exchange of information and peer review, which began in October 2009 focused exclusively on breast cancer, was later expanded to include other types of cancer common to Kosovo. Participants in the Susan G. Komen "3-Day For The Cure" get ready to walk for breast cancer awareness in Pinellas County. 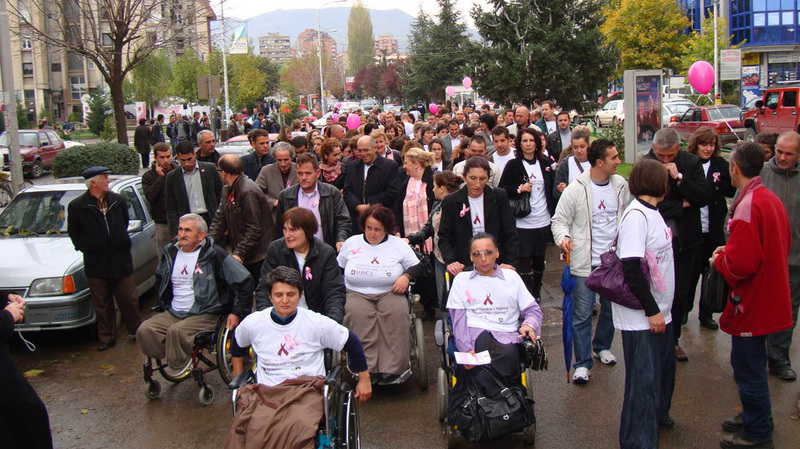 On Saturday, October 24, 2009 in Mitrovica, The Balkans Breast Cancer Initiative (BBCI) and the Community Building Mitrovica (CBM), held the second Kosovo Annual Walk to raise awareness about breast cancer. The walk was sponsored by Office of the Prime Minister for Gender Equality. BBCI was initiated by the American Embassy in Pristina and has obtained the support of USAID, well known Kosovan doctors (including Dr. Elvis Ahmedi), and Kosovan NGOs. CBM is an NGO that works in South (Albanian) and North (Serbs) Mitrovica to improve community relationship between divided ethnic groups. Hundreds of participants in the city of Mitrovica gather to begin the second annual breast cancer awareness walk in Kosovo on October 24, 2009. Photo courtesy of Dr. Elvis Ahmedi. 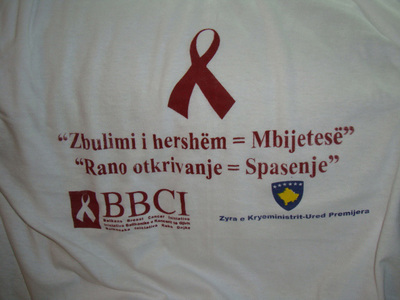 The “divided city” of Mitrovica was chosen for the second annual walk to demonstrate that breast cancer knows no cultural, ethnic or religious boundaries. Hundreds of people attended the Walk. 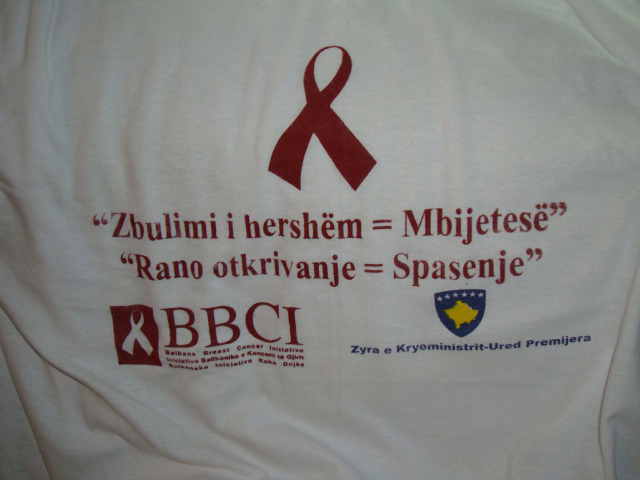 In Albanian and Serbian, the official T-shirt reads "Early Detection = Survival", and includes the BBCI and Kosovan Prime Minister's office logos.